Just bought the proper dynamo for my S7 Deluxe. The one that was on it was from a the earlier S7 model. This one should have more current capability, since it has updated field coils, and four brushes instead of just two. I knew it wouldn't include the bolts, so I probably will have to get those elsewhere... or use the ones that are on the bike. It looks like its in fairly good shape for its age. 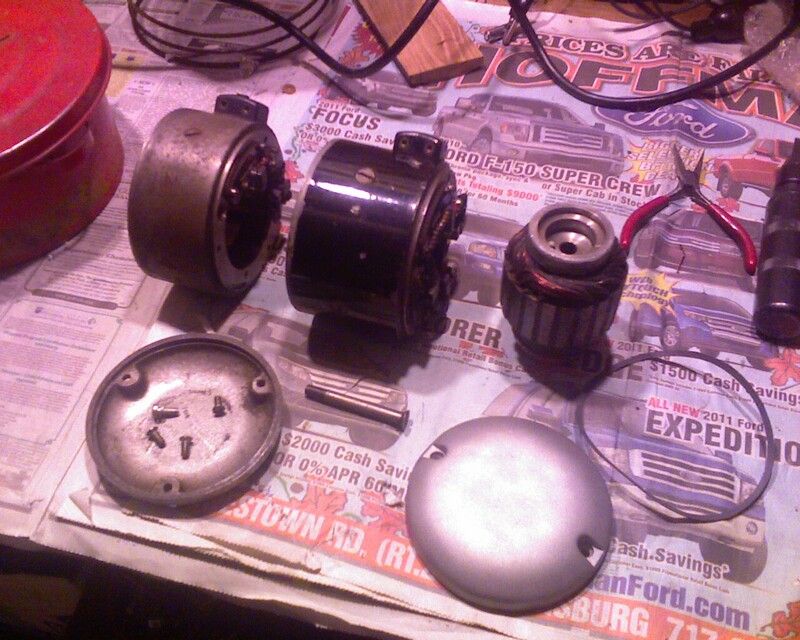 The commutator is a bit rough, but shows no signs of arcing. It should be 100% functional. The brush wires need routed, and the connector needs fastened down too, but it looks like its all there. I may have to dress up the seal surface on the back of the rotor if I decide to use it. There's some pitting. Its kinda a shame that the cover has been bead-blasted. I would have preferred that it still had the original patina. That's not to say that I couldn't GIVE it some patina. Hmmm. The only thing worse than Whitworth threads, is left-handed Whitworth threads. I found a short to the case on the second-hand armature. After some careful examination, I discovered that some of the laminations on the outboard side were displaced (presumably from contact with the field coil core in a previous installation) causing a winding on the top end to be pressed against it. I pushed them apart and inserted some shellac. The ground fault was cured. Hopefully, it will work now. yo quiero comprar el dínamo completo como está en las fotografías tengo una sunbeam 500c.c. 1949 y le falta la dínamo , la caja de herramientas y la caja de batería que está abajo del asiento yo soy de CÓRDOBA ARGENTINA. gracias. I've got the Lucas MC45L dynamo working on my bike. It has a weak output also, which disappoints me. I'm considering a radical upgrade to an alternator system based on a Kubota Tractor permanent magnet alternator. I plan to make the original Lucas MC45O dynamo available for sale on eBay. It works, but has a weak output. You are welcome to bid on it when I set up the auction. This is just to say that your S7 site is great, and I am full of admiration for all of the work you have put into your 'Beam. I am about to attempt removal of the rear suspension units, and I wondered if you could share your threaded rod method of spring compression? I think I probably blundered through the spring removal, pushed the shaft out fromthe center of the springs... and just pulled one end of the spring out and made sure the spring didn't hit anything. Its been a year or so, I think I recall how I got the rear suspension back together. When I went to put the rear suspension back together, I had to find a method. I took some threaded rod with some oversized "washers" I had made from some scrap steel plate and proceeded to compress the rear suspension. I put the top of the rod through the top hole in the frame, overcompressing the spring slightly to get the bottom nut in line with the bottom hole in the frame. The washers allowed the bottom to rest nicely at the edge of the bottom frame and maintain the compression of the spring as I loosened the threaded rod. Once loose the washers were slid out. I think the last step was inserting the hollow shaft. You might have luck using the same method to remove the springs, the trick is getting the washers in... maybe with a putty knife? let us know how you make out. I saw other people using a large C-clamp, but I didn't have one that big. The original dynamo armature, field coils, and brush plate have been sold.